Houston, we had a problem. Somehow a communications problem and heat wave brain cramp or an alien abduction prevented Jamie Hunter from appearing for our meeting last night at the Huronia Museum. Without keys and a security code we could not get inside the building. So we had a field meeting in front of the museum on a couple of picnic tables. Marg Raynor is on the right taking minutes on her laptop. The battery cooperated. We dodged the forecasted thunderstorm and the mosquitoes didn't show up until just after 9 pm when the meeting was quickly adjourned to save our lives. Nine people fed mosquitoes at the meeting. Chapter member David Lamb brought some items to show chapter members. He has been studying how First Nations people turned simple metal files, trade goods from the Northwest Fur Company, into crooked knives. He brought along a simple 8 inch flat file, the starting point so to speak, and then showed several crooked knives he had made using the traditonal methods. 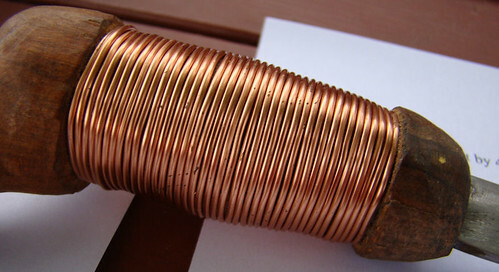 The next photo shows the detail of the copper wire part of the handle. 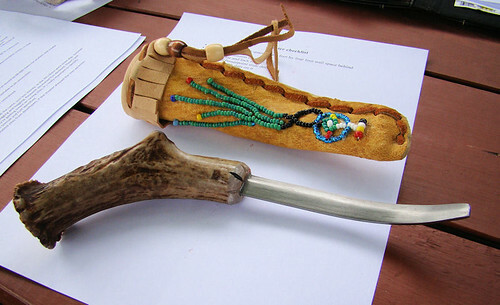 The last photo shows another knife and a sheath. A big thank you to David, thanks for bringing along your work and it was truly fascinating to hold and examine these reproductions made with traditional methods. He is also working on building his own birch bark canoe. More about that in the future as he gets further along with that undertaking. The other main part of the meeting was to review how the chapter's "poster" presentation will be arranged for the September symposium. 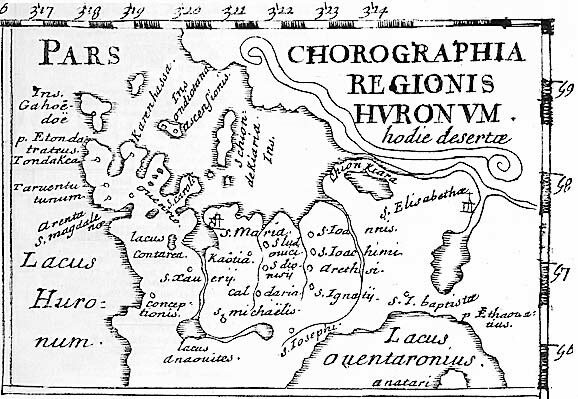 The presentation will show the work done by the Chapter to establish the correct location of the Huron village of Cahiague that Champlain visted in 1615-1616. Great photos Bill and I love the humour! It was certainly an informative and enjoyable meeting! own interest, in this particular case the Crooked Knife. of the knife to which it deserves. the book "MOCOTAUGAN the Story and Art of the Crooked Knife"
Ontario? That could be my next quest. nice report Bill - I am looking forward to a time when we can have David make a formal presentation at one of our regular members meeting. Gary is looking forward to working with David on the beaver skinning from which David will get the teeth he wants. Perhaps other chapter members would like to participate in this or just observe the process. Laurentian U might end up with another set of bones for its lab. Thanks again David for sharing your efforts. Do you think that we can get a BB canoe or 2 for the 2115 Champlain events?